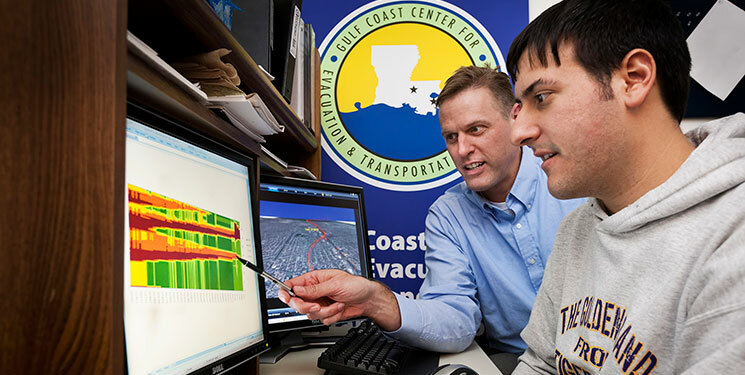 Dr. Brian Wolshon, civil and environmental engineering professor, instructs a student. Photo by Jim Zietz. At just 26 years old, Ralph Sinno has begun a successful career and found a way to unite his passions in a way that will “pay it forward” for his fellow Tigers. The 2011 LSU engineering graduate loves his alma mater and his profession, both honored through his recent establishment of the Ralph R. Sinno Civil and Petroleum Engineering Scholarship. Both of his parents work in education, and Sinno’s passion was ignited in the structural engineering research labs at Mississippi State University, where he would assist his father, an LSU alumnus, before he retired as the distinguished Hearrin-Hess Professor in engineering. “I have a tremendous amount of passion and pride for where I went to school,” Sinno shared of walking in his father’s footsteps at Louisiana’s flagship.